Estonia enjoys a budget surplus after enduring harsh austerity measures, which have been deeply unpopular across the Eurozone. Wednesday, Krugman argued in a short blog that Estonia, “the poster child for austerity defenders,” had only achieved an incomplete recovery. “Better than no recovery at all, obviously—but this is what passes for economic triumph?” he concluded. So what of Estonia’s austerity? 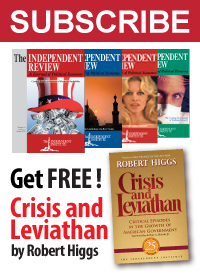 Has it really put the nation on a fiscally-sustainable path? Are Estonians economically benefitting from the steps their government has taken in recent years? Note: All values in the chart above and discussed below are given in terms of nominal (non-inflation-adjusted) U.S. dollars, rather than inflation-adjusted or Purchasing Power Parity-adjusted terms, because these nominal values corresponds to the amounts of GDP, tax collections or government spending per capita that people, including government officials, actually see in real time. Looking at the chart, we find that as a percentage of GDP, Estonia’s total tax collections were remarkably stable for the years from 2000 through 2008, as the government successfully collected approximately 36.1% of the nation’s GDP, less some $66.63 per capita in each year. During that time, we also observe that Estonia regularly maintained either a nearly balanced budget or a budgetary surplus. In 2008 however, the nation fell into recession, with government spending rising sharply and swinging the government’s budget from surplus to deficit, even as its tax collections remained on the same trajectory it had been with respect to the nation’s GDP per capita since at least the year 2000, the arbitrary starting point for our analysis. Unlike the three other governments that we’ve previously considered however, Estonia’s government acted to keep itself on a fiscally-viable path. In 2009, as the nation fell deeper into recession, the government cut its spending by 7.8% from the previous year. Meanwhile, Estonia kept its income tax rates stable, but hiked its Value-Added Tax rate from 18 to 20% in July 2009. As a result of the nation’s higher Value-Added Tax rate, Estonia’s tax collections per capita in 2009 were over 19% higher than would have been collected given the same level of GDP per capita for the tax rates that applied for the years from 2000 through 2008. Estonia’s total tax collections fell from the previous year by just 4.8%, which is especially remarkable considering that the nation’s GDP per capita fell by almost 20% during that year. But that benefit to the government’s tax collections was short-lived, as its total tax collections fell by 6.7% in 2010 from the previous year, falling much faster than the 1.4% rate at which the nation’s GDP per capita declined at the same time. That decrease in tax collections occurred even though the government increased its excise taxes on alcohol and tobacco products in 2010. Raising taxes to solve a fiscal imbalance only works for a very short time, as people will adapt their activities to avoid having to pay additional taxes. More significantly however, the Estonian government reduced its spending by 11.5% in 2010, which is really what put the nation much closer to being on a fiscally sound footing as the nation’s downward economic trajectory began to reverse. With the nation’s economy now recovering, both the government’s spending and tax collections have been rising, with spending in 2011 up by 10.4% and tax collections up by 12.4% as the Estonian government returned to running an annual budget surplus. Meanwhile, the Estonian economy grew by an astounding 17.3%. So how was Estonia able to turn its fiscal and economic situation around so effectively? The answer is that the Estonians did austerity right. Instead of jacking up government spending, in the hopes of stimulating their economy or in the name of bailing out failing institutions or politically-connected businesses, the Estonian government kept their spending under real control. They acted to keep their spending in line with their actual tax collections, which in turn, has kept the nation on a sound financial footing as they succeeded in avoiding huge increases in their national debt. As we’ve seen previously, huge increases in a country’s national debt can act as a huge brake on a nation’s economy. Avoiding large increases in the country’s national debt has therefore helped boost Estonia’s economic recovery. 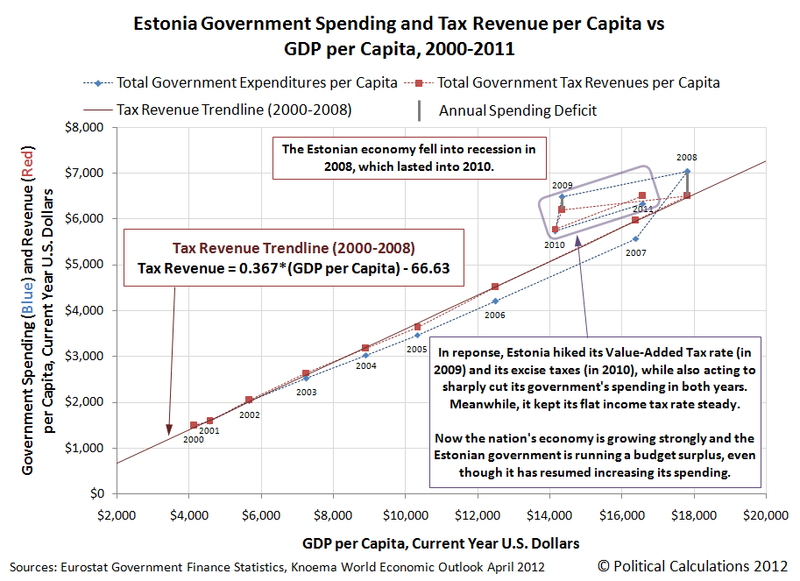 At the same time, the Estonian government increased tax rates, but unlike other nations, and from the perspective of fiscal policy (usually, it’s not a great idea to hike taxes during a recession), they raised the right ones and kept the size of the tax increases they did implement relatively small. Here, instead of foolishly focusing on trying to extract an ever larger percentage of the incomes earned by the most successful Estonians, the people whose economic activities can disproportionately affect a significant share of the nation’s economy, the Estonian government implemented a very broad-based tax increase through its Value-Added Tax, which spread the pain of the tax increase across the nation’s entire population, as it increased its VAT rate from 18 to 20%. At the same time, Estonia acted to ensure that its flat income tax rate would remain stable and not rise. By doing so, Estonia preserved its incentives for *all* Estonians to do the things that can generate more income. Collectively, the things that people can do to generate more income are the things that can significantly grow a nation’s economy. With that certainty in policy, the nation’s economic fortunes turned toward the positive in 2010 and boomed in 2011. We project that in 2012, the Estonian economy will surpass its 2008 performance, marking a full recovery – despite the ongoing overall economic turmoil currently affecting Europe. In fact, the economy has turned around so strongly that the Estonian government will cut its flat income tax rate from 21% to 20% in 2015—relieving a good portion of the additional tax burden it placed on Estonians during its deepest recession years. From a fiscal stability perspective for the Estonian government, that makes sense. One of the key lessons learned among the individual states in the U.S. during the past several years is that sales taxes (which a VAT resembles) are more stable than either personal income taxes and especially corporate income taxes. Estonia’s public finances will be on an even more sound footing going forward as a result. Quite possibly, it will be yet another lesson that the nations of the world can learn from Estonia.